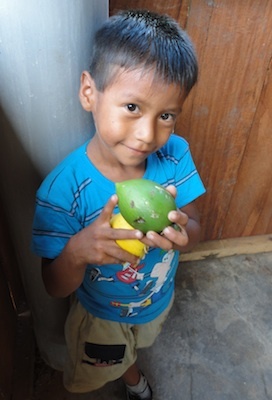 The fruit diversity project is managed by Project Amazonas, Inc., a Peruvian-American non-profit organization that focuses on humanitarian, educational, research and conservation work in the Peruvian Amazon. 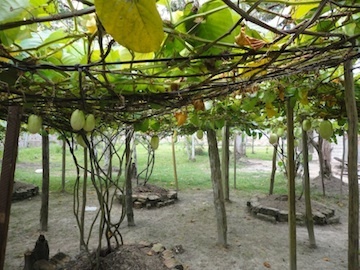 The goal of this initiative is to cultivate a nursery of the widest possible variety of Amazon tropical fruits in a single location, as well as to return forests to their natural balance by reintroducing native trees in areas that have been degraded by logging and slash and burn farming. The site is near the village of Santa Cruz on the Mazan River, just upstream from its junction with the Napo River. Teachers and college students can assist in the project and get a hands-on introduction to the Amazon to bring home and to their classroom while earning undergraduate or graduate credit: Hands-on Amazon for Educators. Volunteers are also invited. 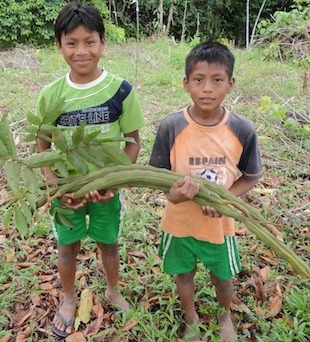 Unlike papaya, coconut and other commonly-known tropical fruits, most local fruits in the Amazon basin don’t have the shelf life, durability, consistent supply, or the financial viability to attain worldwide distribution and are relegated to local enjoyment. Only a handful of the most common fruits are mentioned in this article; dozens more can be found in the surrounding rainforest. Why the variety of tropical fruits? The intense competition of tropical ecosystems, as well as poor soil, variable rains and often months-long inundation have driven plants to creative measures of survival and propagation. 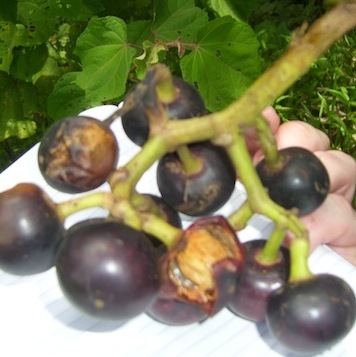 Among the adaptations necessary for the survival of the species is a method of seed dispersal, giving rise to an enormous variety of edible fruits. A seed with an appetizer that will be picked up by a fish or mammal without destroying its viability is advantageous to its survival. As an example, the cashew has a fleshy, appealing “apple”, while the nut is protected against predation with inflammatory and cyanogenic compounds; it succeeds due to this clever combination of pleasure and poison. The nut must be processed to remove the toxic chemicals before it makes it to the store shelf. It follows that this symbiotic relationship with animals has engendered fruits high in nutrients beneficial to the animals that disperse them, especially proteins, oils, carbohydrates, vitamins, and other phytochemicals yet to be appreciated. 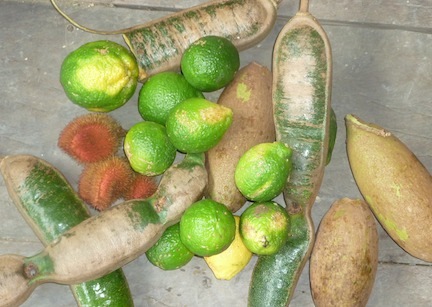 Local fruits are dietary staples on homesteads, as well as ubiquitous in the form of juice drinks and ice cream in Iquitos. 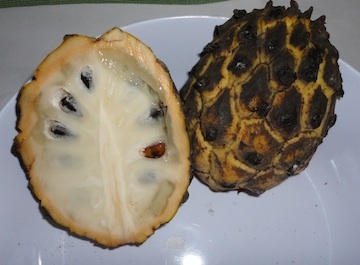 In their raw form, many tropical fruits are high in both sugar and citric acid, making them at once sweet and bitter. Cane sugar (also grown locally) is usually added in their preparations; especially needy are starfruit, cocona, camu camu, arazá and a few others. Some of the most common fruits are described briefly below. Several of them have been imported and widely distributed throughout the tropics but most are of Amazon origin. Since local names vary, often referring to more than one fruit, or to different fruits in different areas of the Amazon basin, scientific names are included. AGUAJE (Mauritia flexuosa) – The deep red, lumpy, egg-shaped fruit is the most common of all the fruits in Iquitos, found on almost every street corner. Yellow-orange when peeled, tasty, but there’s very little to eat (big seed and little meat). The large palm that provides it is impressive. 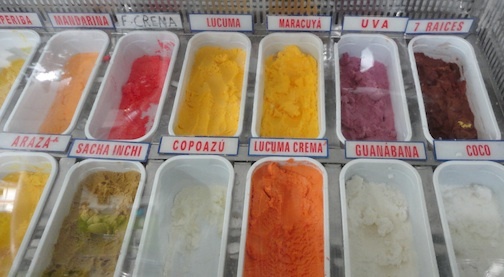 To get the taste of the fruit, stick with the ice cream or buy them fresh, as the fruit available on the street suffers a questionable sanitary standard. ANONA (Rollinia mucosa) A strange looking thing with green-yellow knobs. When it’s ripe (soft to the touch), it’s best to cut it in half and use a spoon to scoop it out – taste of vanilla custard. An overlooked gem, not to be confused with noni!) It’s a random find, sometimes available at roadside stands on the highway. ARAZÁ (Eugenia stipitata), also known as guayaba brasilera. Yellow, highly variable from golf ball- to softball-sized. Soft skin and texture of a ripe peach, a good fruit to munch on, and extremely versatile, useful from marmalade to wine, and of course, juice. A bit acidic. 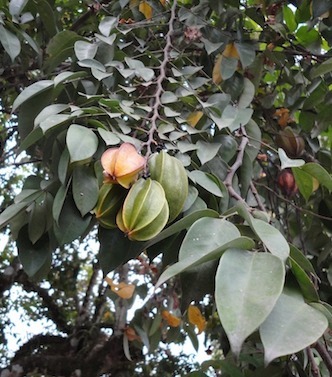 The native Peruvian version (guayaba) produces smaller fruits and is more susceptible to insect predation, but can be made into an excellent marmalade. CAMU CAMU (Myrciaria dubia) has the highest concentration of Vitamin C of any known fruit in the world. There is also significant and promising research indicating that the phytochemicals in the fruit are effective in treating a variety of medical maladies. 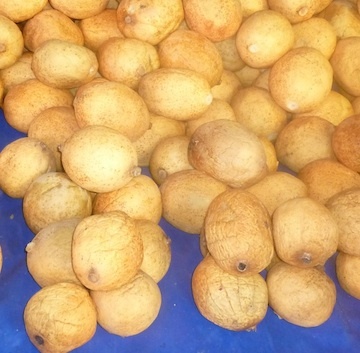 LUCUMA (Pouteria spp.) – an incredibly unique taste! It’s dense and sticky, not something eaten by itself, but it’s so unusual that it can be found in many forms including chocolate-covered drops. MARACUYÁ (Passiflora edulis) – a mid-sized yellow passion fruit, teardrop shaped, common in the Belen market. Very similar to GRANADILLA (Passiflora ligularis), another passion fruit. The myriad seeds are covered with a sweet gel that doesn’t make for the easiest eating fruit, but a common fruit juice in season and a frequent beverage in local eateries. UVILLA (Pourouma cecropiaefolia) Amazon grapes, similar to purple grapes but with a much larger seed. Frequently found in smaller markets in season. TUMBO (Passiflora quadrangularis) – a giant passion fruit, frequently trained on a home garden trellis. Taste similar to cantaloupe. Tumbo in the market and on home trellis. CARAMBOLA / star fruit (Averrhoa carambola) – one of those sweet and sour fruits that needs a little sugar. Widely cultivated, it’s an import, probably from the East Indies. COCONA (Solanum sessiliflorum)– a native tomato. In the wild, they’re often covered with coarse fuzz. They can be eaten raw but the skin is thick. It’s sweetened to make a drink commonly served in local restaurants. CACAO (Theobroma cacao) Like copoasú, the pulp around the seed is consumed and the seed is discarded except in commercial operations for making chocolate. 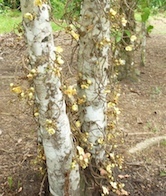 Fruit grows directly from the trunk, not unusual in tropical fruits. COPOASÚ (Theobroma grandiflorum) The soft pulp around the seeds is the tasty part, redolent of rum. The hull is nearly as thick and tough as a coconut. 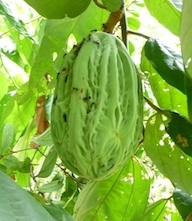 MACAMBO (Theobroma bicolor) – resembles a green football brain. More likely to see the grilled tasty seeds than the actual fruit. 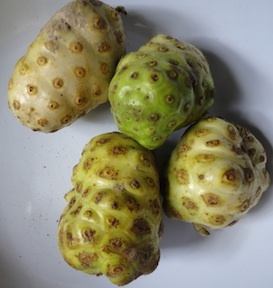 NONI (Morinda citrofolia) nicknamed cheesefruit for good reason. 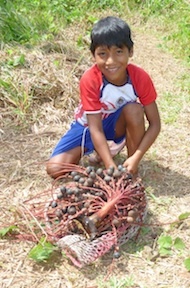 It’s respected by the locals for medicinal uses, and can be eaten as a survival food. There’s a type of Danish cheese that has a similar malodorous property – I’m told it’s good if you can just get it past the lips, but you can’t wash the smell off your fingers. 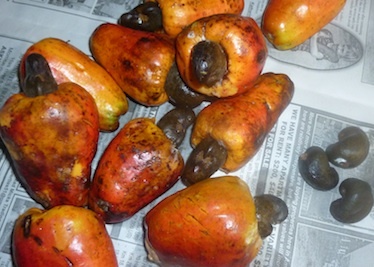 MARAÑON / CASHEW (Anacardium occidentale). Grouped with cacao here because many people don’t know that the best part – the cashew nut, is discarded. 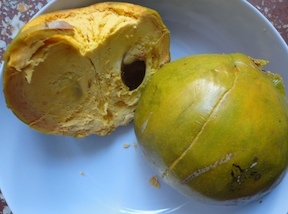 The “apple” part is eaten, similar to mamey, but the nut is protected by two layers of deterrent; don’t eat it raw unless you want to get poison-ivy like blisters, – the seeds have to be commercially processed to be edible. TAPERIBA (Spondias dulcis) Common in drinks, ice cream, even pastries. 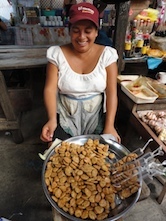 Eaten raw when in season, the somewhat tenuous flesh sticks to a stringy pit, but it has much more meat than aguaje. 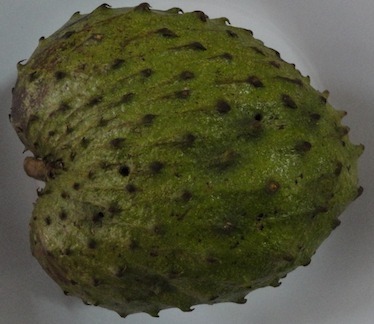 GUAYÁBANA (Annona muricata) Easy to identify by its deep green color and spiny skin, it is dense, solid, yet amorphous. 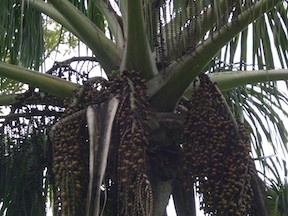 SINAMILLO (Oenocarpus mapora) and UNGURAHUI (Oenocarpus bataua) with clusters of small hanging fruits, these are more typical of palm fruit than is the familiar coconut. Sinamillo is mashed into a cocoa-colored drink. Ungurahui fruit is extremely nutritious, high in good-quality protein and oil. Left: guayábana. Center: child plucking sinamillo. 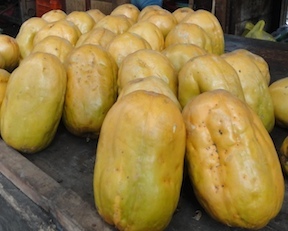 Right: sapote vendor. 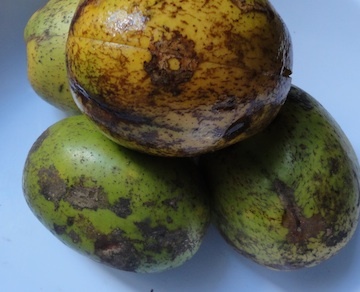 SAPOTE (Matisia cordata). Attractive olive skin, and rich peach-orange color inside, taste of a great melon but more meaty. HUITO (Genipa americana), the size of a large fist, gets sickeningly sweetly pungent when ripe. These are well represented in the medicinal plants row in the Belen market, and the young fruit produces an indelible ink and body paint. 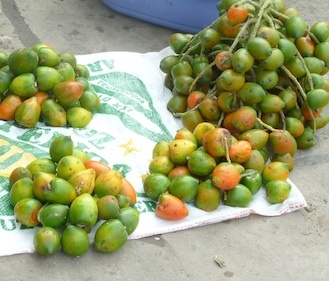 PIFUAYO (Bactris gasipaes) Clusters of egg-sized fruit can be green, yellow, or orange, from a tall, spiny palm tree. They can be eaten raw, but are more commonly boiled, peeled and salted. GUABA (Inga edulis) Sometimes called ice cream bean, it is not related to the vanilla bean. The long pods are twisted to reveal a dozen or so nuts wrapped in a moist, cottony, pleasant tasting snack. SACHA MANGO (Grias peruviana) Generally, “sacha” can be translated as “wild”, “pseudo”, or the like. It is not at all related to mango. It has a huge seed, and the edible part around it has the color, texture and taste of carrot. CAIMITO (Chrysophyllum caimito ) the trees produce a huge crop seasonally and can be found most of the year. Quite tasty, but the skin releases latex when broken, making for sticky lips unless it’s peeled first. 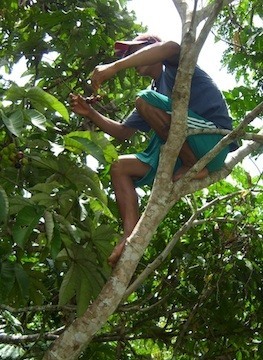 Some fruit trees have been heavily planted in and around Iquitos primarily for their ornamental value. 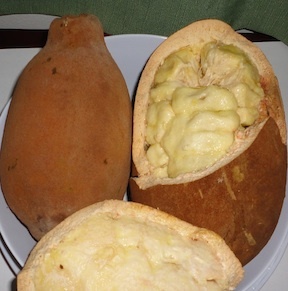 Mamey, breadfruit, huasai (and some other palms) are the most common. Pictures will follow in a later post. BREADFRUIT / Pan del arbol (Artocarpus altilis) The seeds are boiled with a peanut-like flavor, and the pulp is high in starch. An import, the fruit was brought to attention by the fascinating story of the voyage of the Bounty. 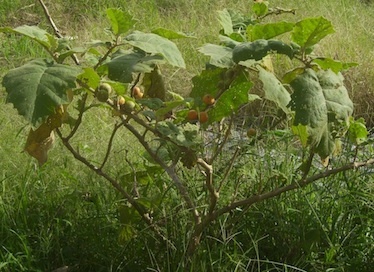 Breadfruit trees are a common sight along the banks of riverine settlements. HUASAÍ (Euterpe spp. ), A sister of the Brazilian acai berry, which enjoyed a brief explosion in popularity in the States as a weight loss scheme. The tree has a slim, elegant look and are a favorite municipal planting, notably along the Nauta highway and at the airport. MAMEY / poma rosa (Syzygium malaccense Merr&Perry) with dark green foliation, the tree is easily trimmed to a nice shape, and drops a fruit closely resembling an apple both in taste and appearance, except for its large pit. The texture is softer, too, more like a ripe pear. The apple is eaten raw and doesn’t make its way into drinks or ice cream. There are several of these trees on the Plaza de Armas in Iquitos, in bloom in August with magenta flowers. 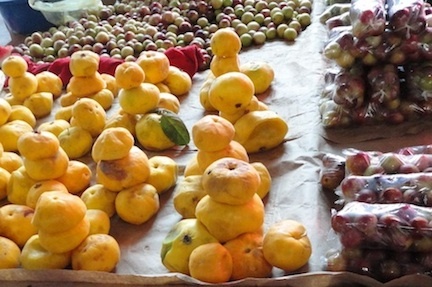 CIDRA – this is a common, inexpensive fruit, a green-colored orange wanna-be. Stringy and as bitter as lemon. Because of the variability of local citrus, these can appear similar to sweeter oranges. They are shown in the first picture in this blog, posing as limes. COCO / CACAO / COCA – for the casual tourist, it’s important to differentiate amongst the similar-sounding things. They are not at all related. 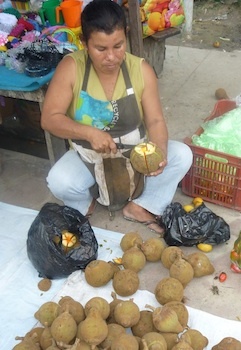 COCO is coconut, a nice treat when you’re thirsty at fruit stands on the highway chilled, opened with a machete and served with a straw. 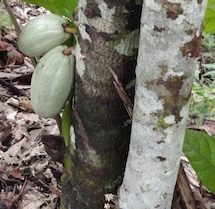 CACAO is mentioned above, the fruit that produces the seeds that are processed into chocolate. COCA is the leaf that can be processed to produce cocaine. The dried leaves are boiled for tea (mate de coca) as a general stimulant and to combat altitude sickness (soroche). BANANA – very briefly, there are several types that can be called plátano. Plátano maduro is very firm, served grilled or sliced and deep fried. Sweeter and softer bananas are eaten raw or sliced lengthwise and gently pan fried. Last update: December 2012. Credits: All photos taken on site in Iquitos, Mazan or Santa Cruz, Loreto, Perú.